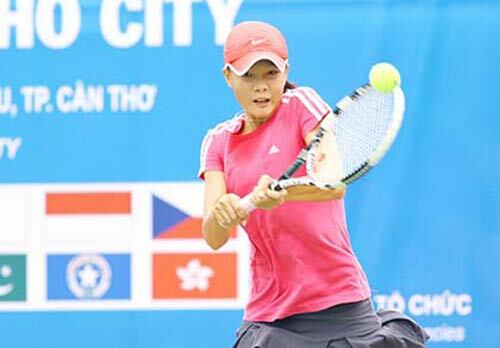 HA NOI (VNS) — HCM City's players won two titles at the National Tennis Championships, the Vietravel Cup, in Ha Noi on September 22. In the women's doubles final, Tran Thi Tam Hao and Si Boi Ngoc of HCM City defeated Phan Thi Thanh Binh and Do Dan Thi of Da Nang 2-0. Veterans Do Minh Quan and Le Quoc Khanh won another title for HCM City by beating Huynh Chi Khuong and Tran Thanh Hoang of the Military team in the men's doubles final. The mixed doubles' title went to Tran Thanh Hoang and Nguyen Tu Kim Ngan of the Military team, who crushed Tiffany Nguyen and Vu Artem of Binh Duong 2-0 in the final. In the women's singles final, Lian Tran of Binh Duong will meet Hao of HCM City, while Pham Minh Tuan of Da Nang faces Hanoian Trinh Linh Giang in the men's singles final.